Your unique energy is something that often affects others, and also how they initially perceive you. While everyone has their own distinct energy, part of it can be attributed to your personality type. 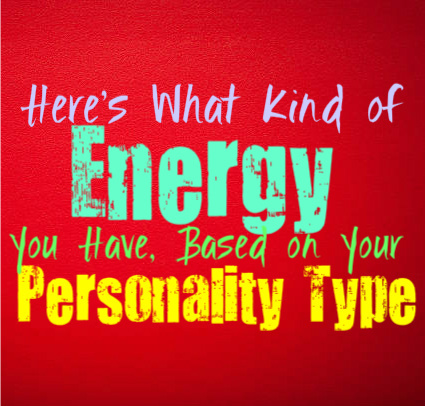 Here is what kind of energy you possess, based on your personality type. INFJs have a very intense energy, but somehow it is one that does not leave others feeling nervous around them. Their compassion is something that can be felt by others, leaving a rather judgment free air around them. The energy of the INFJ causes people to feel drawn to them, and at ease around them. Many people will find themselves opening up to the INFJ without fully understanding why they are doing this. The INFJ might have an intensity to them, but their energy is very warm and even a bit piercing. The way the INFJ connects with people often makes it feel like they are peering into the depths of your soul. ENFJs have a rather vibrant and driven energy, but at the same time very warm. People often feel at ease around them, even before knowing the ENFJ all that well. They have a knack for making people want to open up, without even saying anything. Their energy puts off this sort of comfort around others which helps them feel safe to express themselves without judgement. Their warmth and compassion is something that shines through very clearly with the ENFJ, leaving others feeling positive and comforted in their presence. INFPs have a very idiosyncratic, yet fluid energy, which can be hard for most to understand. INFPs are often very noticeable people, at least when you get up close to them. They might be the wallflower sitting in the back of the room, but once you strike up a conversation you will be able to see that spark they possess. They are creative and passionate people, with deep and complex souls. The energy of the INFP is often something that leaves people feeling rather intensely about them one way or another. ENFPs have a very vibrant and spirited energy, which often radiates in a very affective way. People can feel this from the ENFP, and they can feel their strong sense of passion. While they might be intense people, their energy doesn’t make people uncomfortable in a negative way. It often leaves people feeling like they have been caught up in this whirlwind of excitement and joy. ENFPs are such passionate people, and this is something that can be clearly felt when you are in their presence. They are full of vitality, and their energy exudes this. INTJs have a very cerebral energy, which can be rather intense for most. They have a dynamic spirit which can be a bit piercing for some people to be around. INTJs are so focused on learning and are constantly trying to improve themselves in any way they can. Their hunger for knowledge definitely causes them to put of a very intense energy around others. Some people might be intimidated by this, while others are drawn towards it. People who are drawn to the INTJs energy often want to learn more about them, and are intrigued by their inner minds. ENTJs have a very dynamic and intense energy, which can be a bit overwhelming for some. ENTJs are focused on building a positive future, and have a strong sense of directness with others. Before even communicating with the ENTJ this energy can often be felt by those around them. To some this becomes intimidated, and might even cause people to fear the ENTJ a bit. For those that find them intriguing they often learn that the ENTJ has another side to their personality which is caring and fun-loving. INTPs have a very intense and complex energy, which can be intimidated for some. While some are left feeling confused by the energy of the INTP, there are others who are intrigued by it. They are complicated people, with unique inner worlds that are rather captivating. INTPs often put of this intense energy from the start, which can leave some people nervous around them. They have many sides to their personality which is a big reason why their energy can be so overwhelming for others. ENTPs have a very dynamic and vibrant energy, which comes from their passionate nature. ENTPs can often be perceived as intense by others, and might be a bit intimidating to some. They are charismatic people who often approach things from many different angles, which can be somewhat confusing for others. While some can be a bit intimidated by the ENTP, most are intrigued by their lively and passionate energy, which is hard to miss. ISTJs have a rather cerebral and somewhat subdued energy, since they are so focused inwardly. They are internal people which makes their energy something that draws others in, rather than exudes in a more obvious way like some types. ISTJs are driven people who are constantly focusing on learning and improving themselves. They care about their loved ones though, and are perceiving differently by them than people who initially meet them. ESTJs have a rather fiery and powerful energy, which can be intimidating for some. They are intense people who always go after what they want without letting anyone stand in their way. They believe in working hard and doing their best, and value efficiency above most things. The strength within the ESTJ is often something that exudes out of them and affects others. Their desire to get things done makes them appear rather focused, even before people have gotten to know them better. ISFJs have a very warm and comforting energy, which makes others feel at ease around them. They are natural caretakers and strive to support the people around them. Their compassion towards others is something that affects those around them, and makes it easy for people to connect with the ISFJ. They make others feel at ease without having to do anything, this is just something that can naturally be felt from their energy. ESFJs have compassionate energies, which helps put others at ease around them. People often find themselves opening up to the ESFJ before they even know them. ESFJs make others feel comfortable being themselves, and this is something they exude before they actually get to know people. They are caring and strive to tend to the needs of their loved ones, this desire to care for others is something that is easily read by others. ISTPs have a mysterious and internal energy, which often leaves people intrigued by them. They have a rather intense nature which can cause others to be intrigued by them. Their energy doesn’t really leave things obvious for others, which is often what leaves people feeling more interested. ISTPs have a mysterious nature which only seems to cause others to want to dive in and learn more about who they are and what makes them tick. ESTPs have a very lively and dynamic energy, which exudes towards others. They are passionate people and this is very obvious to others, since the ESTP lives very much in the present moment. They live their lives to the fullest and have a rather adventurous spirit which keeps others on their toes. ESTPs can sometimes be intense people, but at the same time their powerful energy can also be rather warm and compassionate towards those around them. ISFPs have a vivacious and open nature, which definitely can be felt by others. ISFPs are very internal people though, so their energy rarely makes people feel overwhelmed. They focus inwardly and have strong inner morals which guide them through most of their decisions in life. ISFPs aren’t easy people to read on the surface, and require plenty of digging to truly understand who they are. Outwardly their energy is free-spirited and fun-loving. ESFPs have very passionate energies, which can be felt by those around them. Before even meeting the ESFP people can often feel this bright energy exuding from them. They are energetic people whose energy often vibrates around others. They enjoy living in the moment and always try to remain positive and this part of their personality is definitely something that affects others, and causes their energy to connect with those people before even getting to know them.